"I am taking a few minutes from my busy work schedule to express my thanks for the excellent services provided by your company to the Zoé Vallé Library in Chester. I especially want to thank Jeffrey Ingraham and Mary Comeau . . .
Click for the rest of Lyne's letter! 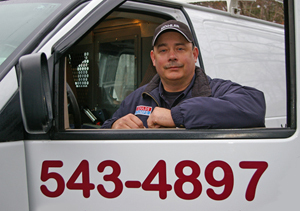 At Langille's Plumbing & Heating, we invest in the latest tools and equipment to solve all your plumbing problems and needs. Langille's technicians know whether a drain has shifted, is broken, has root damage or whatever the problem and accurately advises the home owner on the best plan of action. Video camera pipe inspection - goes where techs can't! A video camera pipe inspection allows for a visual inspection of underground sewer lines and other piping to determine the conditions inside the pipe. Video cameras may be used to identify pipe damage and obstructions that inhibit proper flow or create occasional, or repeated, backups. The cameras also verify that obstructions have been eliminated and the lines are clean following service. Typically, pipe conditions cannot be determined without a visual inspection using an in-line camera. Grease, sludge, sand and debris block drains and stop systems cold - at home, business or public building. 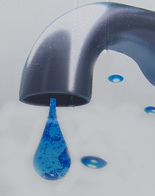 Remember, regular preventive maintenance is key to keeping drain lines flowing freely. Most restaurants and other commercial establishments require frequent high-pressure drain cleaning to remove mineral deposits, grease buildup, sludge and debris that accumulate in the lines. Clogs can cause down time - and in any business, down time costs money. If your sewer line is blocked, your problems end with Langille's - we have the right equipment for the job. When our technicians are dispatched to a sewer line blockage, they arrive with the purpose equipment to get things moving again. We have several power snakes, ranging from 35 feet for small drains, 75 feet for 2" drains or the large power snake for 4" drains which can clear a blockage at 200 feet. The power snake's cutting tool pulverizes roots. If roots have invaded your sewer line, blockages can be prevented by regular removal of the roots with our power equipment. How to restore blocked septic fields? Paul Langille recommends Bio-Clean for restoring blocked tile fields. His technicians will do it for you, or, if you prefer, you can do-it-yourself - Bio-Clean is available in Bridgewater at our shop and showroom - 261 York Street. [Langille's] replaced my damaged sewer pipe system with new piping. I was very pleased with their knowledge and professional manner . . . I would definitely recommend your company to anyone who needed good quality efficient service. Water and sewer line replacement not only involves replacing the damaged lines, but often results in the need to landscape again. 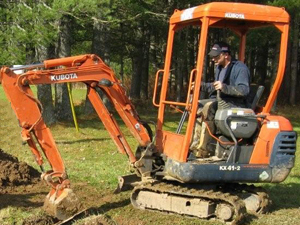 Langille's mini excavation service reduces the property damage caused by larger machines. It's perfect for excavation in tight spaces. Often the septic tank service or effluent pump chamber is below ground and repairs require exposing the chamber. We can save you the mess and expense of bringing large equipment over your property. Langille's team of qualified technicians is pleased to complete the job from start to finish.